When I attend a convention I like to browse through the original artwork to bask in the glory of beauty that I will never own. For example, take a look at the above Jack Kirby page from The Hulk #3. It's large-size art of course, twice-up. Sweet. 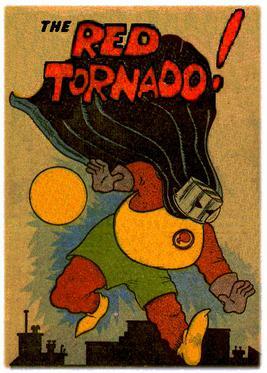 Just a week or two ago I was writing about how I yearn for a collected edition of 1940s Sheldon Mayer Scribbly stories, which also featured Ma Hunkle as The Red Tornado. Imagine my surprise at C2E2 when I saw that Red Tornado perfectly brought to life by a cosplayer. I immediately reached for my camera! 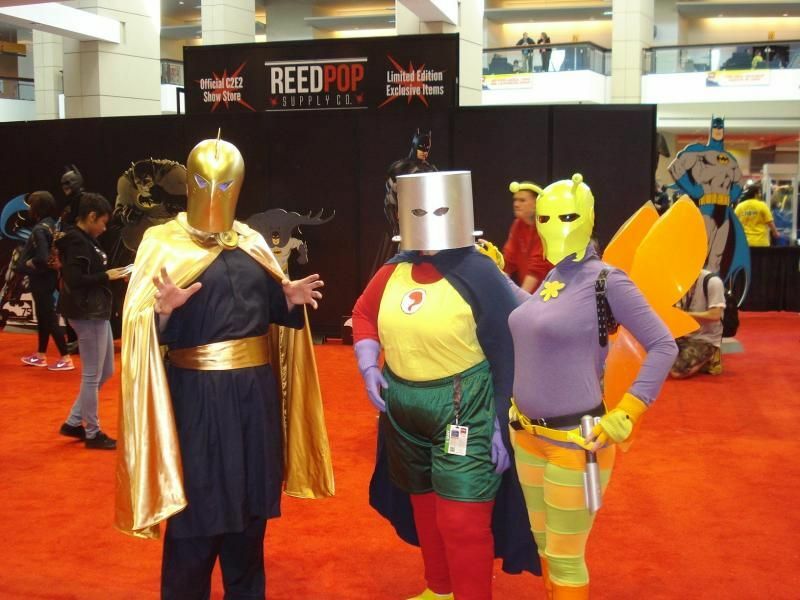 Of course that's Doctor Fate on the left and I'm pretty sure it's Batman villain Killer Moth on the right, but Sheldon Mayer's Red Tornado is smack dab in the middle. The costume is perfect! And you have to be a pretty serious comics fan to even know of that character because Ma Hunkle has not appeared in costume in a comic book story since All-American Comics #59 dated July 1944! Yesterday's Spidey-Verse panel at C2E2 began with a singalong of the wonderful 1967 Spider-Man cartoon theme song led by Marvel editor Jordan D. White on ukelele. As corny as that might sound, it was the greatest single thing I've seen at a comic convention in years. Mr. White played and sang beautifully and the massive audience in the cavernous panel room sang along. I have no audio of that excellent performance but I do invite you to listen below to the original version of that fun song. I didn't care too much about Captain Action in the 1960s and I still don't, but it was announced at the panel that they're working on putting together a Captain Action animated series with Marv Wolfman as the head writer. I would watch that cartoon. 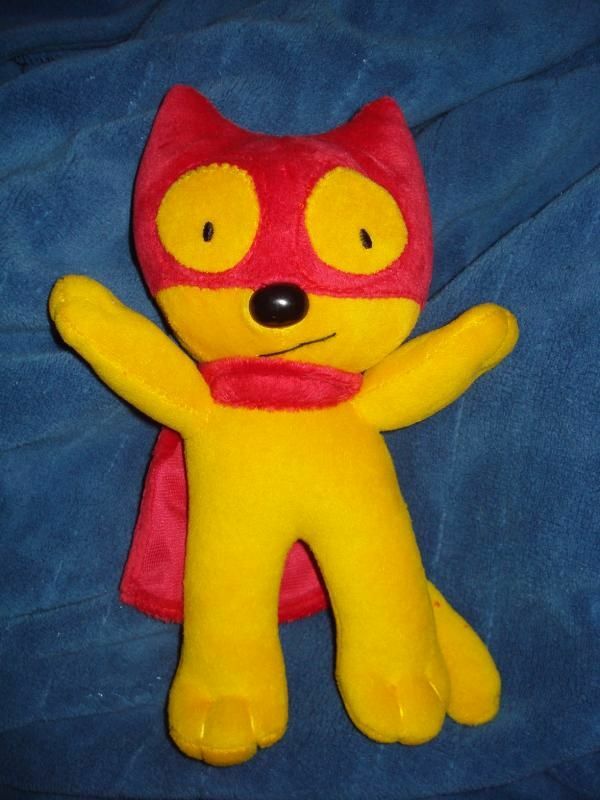 Aw Yeah, Action Cat Doll! I just snapped the above photo of Action Cat as he was flying overhead. In fact it's a photo of the new Action Cat stuffed animal, but isn't it so realistic that you think you're looking at Action Cat himself? It is my pleasure to add the Action Cat doll to my collection. You can get one for yourself (as well as back issues of Aw Yeah Comics!) over at this website. If you're in Chicago for C2E2 this weekend you'll probably just want to stop over at the Aw Yeah Comics table so you won't have to wait for the mailman to deliver your friend. I like the 1960s comics that feature the above Famous Artists School advertisement on their back covers. 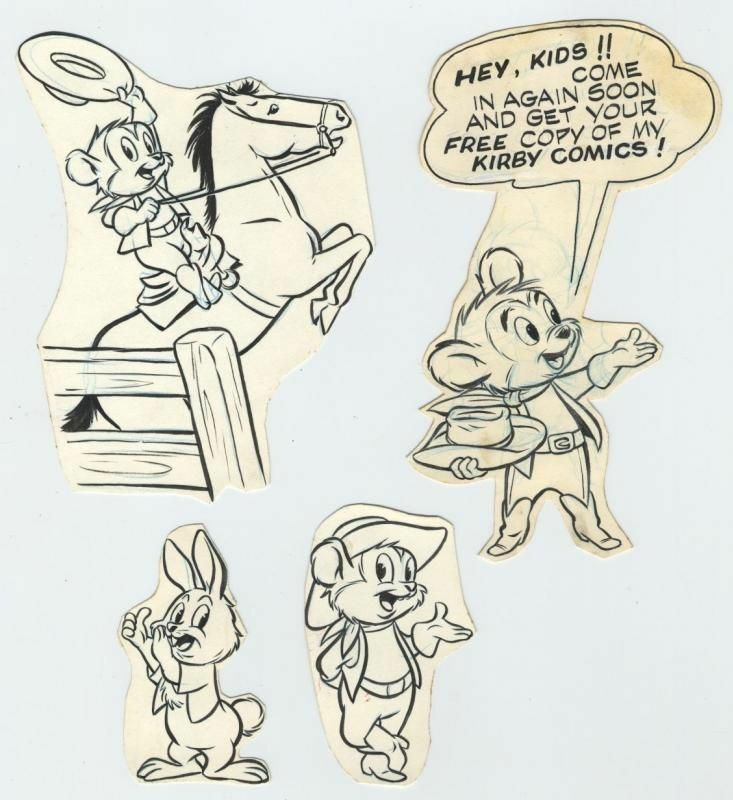 I never gave one second's thought to clipping the coupon and sending my name in to that school though (whereas I did think for a bit about applying to the Joe Kubert School the year it opened, as I previously mentioned over here). 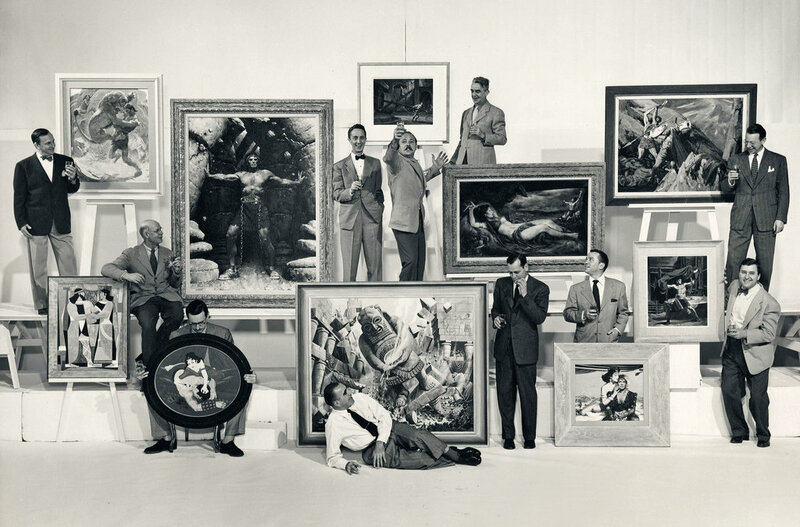 The famous artists (that's them down below) who developed the curriculum for the F.A.S. correspondence courses left behind an archive of material that only recently has been directed to The Norman Rockwell Museum. You can read the full details over in this New York Times article from last month. Joe Kubert and Carmine Infantino are two of the finest and most beloved artists ever to draw for comic books. I'll bet that you remember the first appearance of the Silver Age Flash in the 1956 Showcase #4 was pencilled by Mr. Infantino and inked by Mr. Kubert, but that was not the first collaboration of those gentlemen. 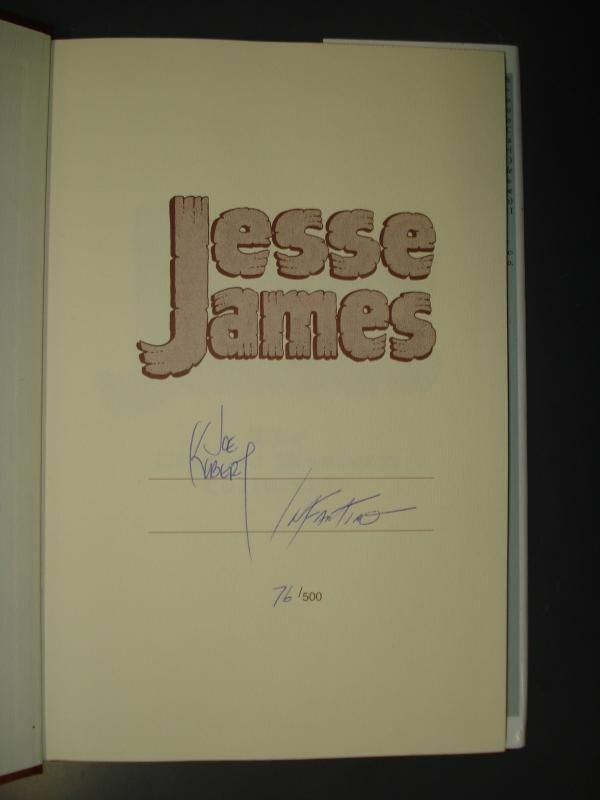 Earlier in the 1950s the two teamed up on a number of stories for the Avon comic book entitled Jesse James, and their work was collected in a little hardcover edition back in 2003. It slipped under my radar at the time (like many things do) but I learned of its existence recently and decided to add that tome to The Hayfamzone Library. I found a good deal on ebay and ordered it. After mailing the book seller wrote me a note telling me that as he was packing it he noticed that it was a signed-and-numbered edition of the book and he congratulated me on my lucky star. I do feel very fortunate to have the hand-written signatures of both wonderful artists on the title page of this book. Do you own the Jacob and the Angel statue? I do not. Cast in pewter in 1989, limited to 2500, and based on Jack Kirby's below-shown Jacob and the Angel drawing, the piece is a difficult find these days. (Here is the story behind the statue.) My statue collecting didn't begin in earnest until a year or two after this item's release so it slipped by under my radar back in the day. I came thisclose to winning one on ebay last week. The annual C2E2 comic book convention will be this coming weekend right here in Chicago and of course I will be in attendance. No, there won't be a Hafamzone Panel this year (but look over here for a reminder of how much fun that was two years ago), but please do step up and say hello; you'll know me because I'm the tall one. There was one interesting item from last year's C2E2 that I never got around to mentioning and I'll remedy that right this minute. I am always looking for the next great thing and here's one time that I got more than I bargained for. I was drawn to the table where the graphic novel Gentle Carmel, Into the Black Dumb was displayed. This is like no other graphic novel I have ever seen, and you can inspect some sample pages up above. I chatted with writer/artist Brian Schrank and complimented him on his unusual achievement. The 146-page full-color squarebound edition is very reasonably priced at amazon.com. Or, after you read what Mr. Schrank has to say about his project over here you can download the book as a pdf file for FREE! 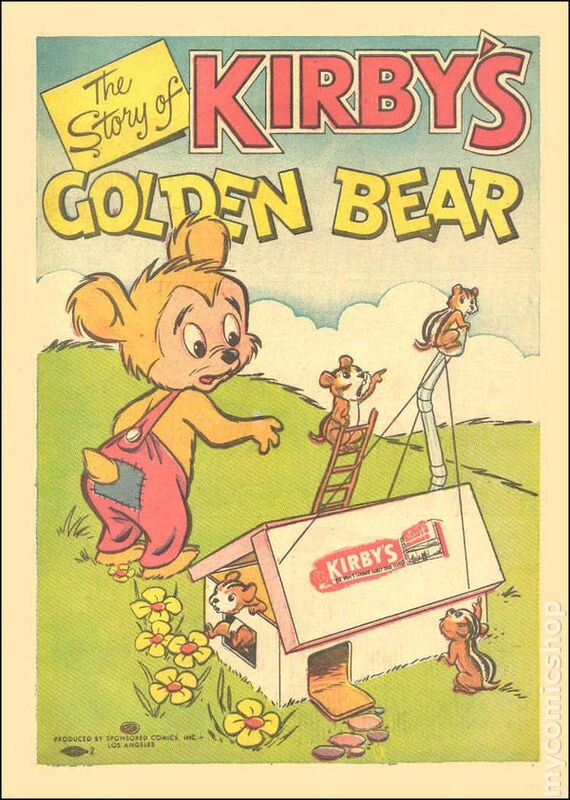 I almost bought the above Kirby Bear artwork but I was outbid in the closing seconds of the ebay auction. 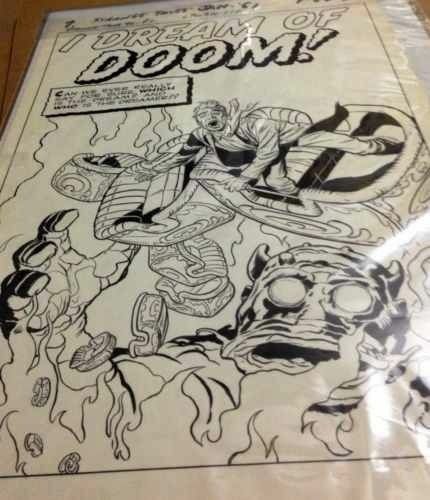 Since Jack Kirby artwork is so steeply priced these days, I look into buying artwork that is merely tangentially Kirby. Like Kirby Bear. 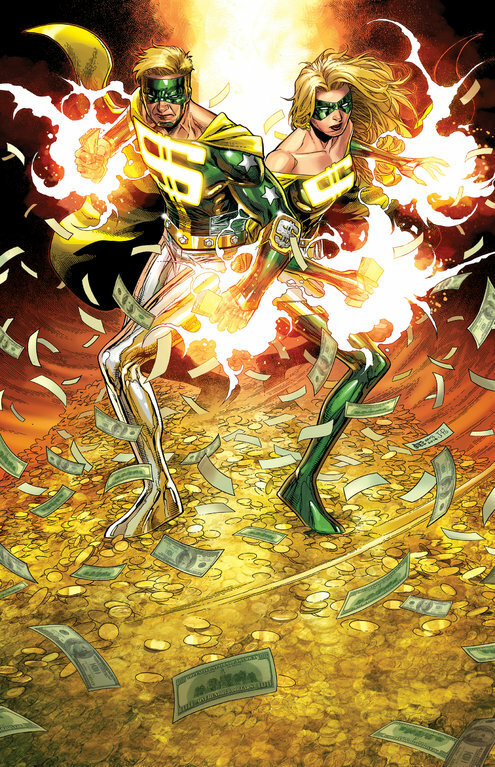 Guess Who I Saw on Wonder Woman? Yesterday while I was doing something in the kitchen I had the television on but wasn't playing close attention to it. The Lynda Carter Wonder Woman show was on and I looked up to see a bad guy dressed in an army captain's uniform. He was in the scene's background and I saw him only for a few seconds but I said to myself with complete certainty Whoa, that's Jay Leno! I executed my usual painstaking hayfamzone research and learned that the 1977 episode was entitled "The Bermuda Triangle Crisis," but IMDB indicates that its cast credits are complete and Jay Leno is not listed. Unfortunately I did not hear the character's name on the show and, just as unfortunately, not all of the men listed in that episode's cast have a photo accompanying their name. So my delving into this matter has dead-ended for the time being. But there was no doubt in my mind when I saw that captain that the actor was Jay Leno. Marvel Comics artist Jim Cheung had the above full-page superhero drawing appear in color on page 1 of last weekend's New York Times Business Section and I think it's pretty nice. You can read that article over here. When I saw the great photos in the morning newspaper of the window washers dressed as superheroes I knew I wanted to share a couple of them with you. The dress-up is to entertain patients at the children's hospital, and there are more photos to be seen over here. I never before today came across the above Jack Kirby splash page to one of the monster stories in Marvel's 1961 Strange Tales #96, but I definitely like it. 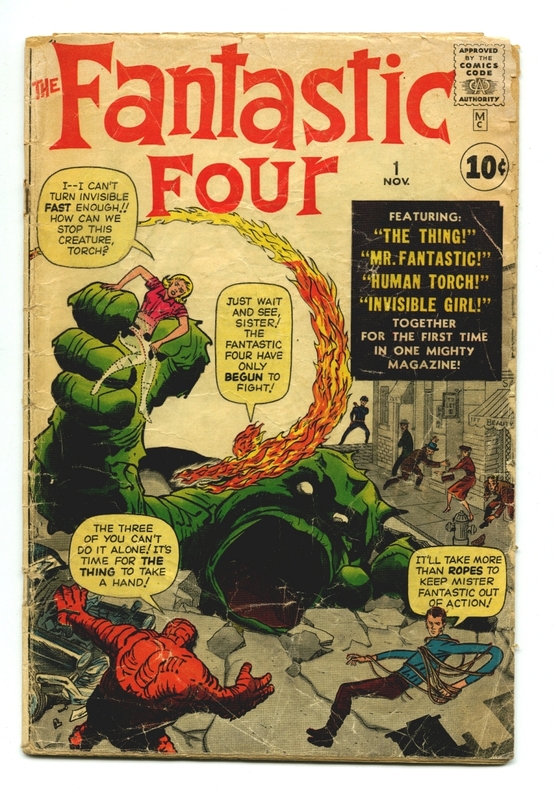 Maybe you notice the similarity to Mr. Kirby's cover to Fantastic Four #1 from the same year, what with a horned monster from below outstretching his arm. The owner of the page noticed the similarity and is capitalizing on it to the max. He is selling the page on ebay for a firm $1,000,000. Maybe the artwork to the actual FF #1 might draw the million, but this page? Probably not. A slight irony is that I feel the above drawing is better composed and more interesting than the FF cover. While it lasts you can view the auction for the artwork over here. This week I'm selling Scribbly #8 on ebay and I decided to check if any other sellers were also offering that issue. The search results gave me my biggest surprise so far this calendar year! Scribbly saw print in a couple issue of a Dell comic book before he ever appeared in any DC title! 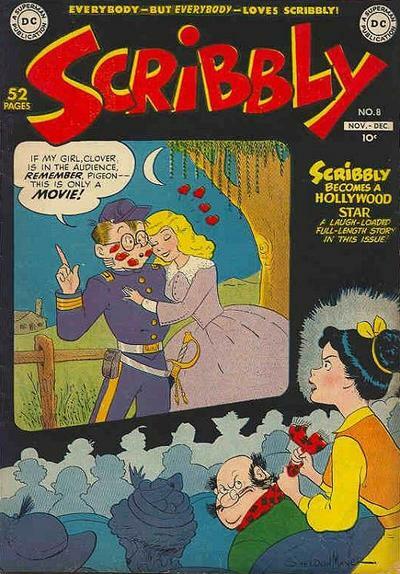 In my search for Scribbly #8, a 1936 Dell issue named Popular Comics #8 popped up. I had never before heard of Popular but the seller had included "Early Scribbly" in his description. What a maroon, I thought to myself! This seller is a charlatan who knows nothing about comics, I smugly continued to myself. But the seller was correct (and you can read more details over here). By the way, I never dreamed in a million years that DC would publish a Sugar and Spike Archives Edition. But they did. Let me go way out on a limb here and wish that DC will likewise publish a Scribbly Archives Edition. Before graduating to his own series, Scribbly appeared for years in All-American Comics (both with and without Ma Hunkel, The Red Tornado) and I haven't read those stories. But I would like to. 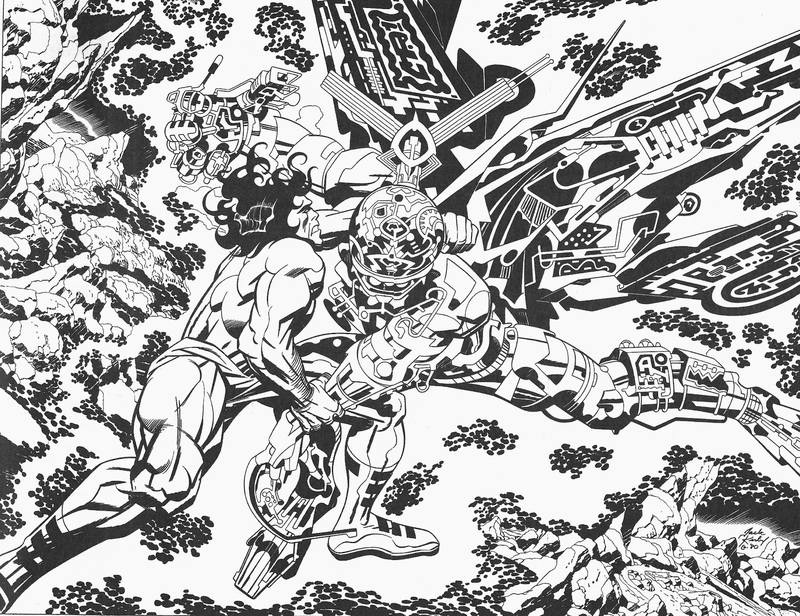 Anxiously Awaiting Jack Kirby's New Gods! Back here I told you that IDW announced that they will be publishing an Artist's Edition of five issues of Jack Kirby's New Gods, shot directly from the original artwork. Publication is imminent now and I am giddy with anticipation! Back in the fall I pre-ordered the book from IDW because I definitely want to be the first on my block to own it. Well, guess what. As a pre-ordering customer I am privy to information that I have seen reported nowhere else! But of course I'll tell you what I know. Over the weekend I received an email from IDW saying that the New Gods edition has been enhanced from 144 to 176 pages (including one or more double-foldout spreads like the ones shown below) and that the retail price of the tome has consequently been increased by 20% (but that my pre-order has guaranteed me a copy at the original price, hoo hah). I know I will have more to say when this book comes in the mail.